Addressing global issues as diverse as the energy crisis, diabetes and mining safety, Professor Paul Dastoor and his team are at the forefront of the emerging field of organic electronics. Designing revolutionary devices such as solar paint and needle-free glucose tests, Professor Dastoor's innovations are set to improve the environment and lives of communities around the world. Currently in the final stages of perfecting the process of printing water-based solar paint, Professor Dastoor and his team of 30 researchers at the University of Newcastle's Centre of Organic Electronics are about to start printing hundreds of metres of solar cells per day. They have also become the first in the world to build energy-efficient devices from water-soluble solar paint materials. The greatest issue the world is facing is energy production. We have billions of people who have no access to energy or electrical power at all. "How do we solve this issue? We capture the sun's energy through solar paint and turn our homes, cars and appliances into solar power stations." Organic electronics deals with carbon-based electronic materials that are soluble in a variety of liquids. This makes them able to be dissolved into solutions, which can be printed, painted or sprayed onto different surfaces whilst still being able to conduct electrical charges. Professor Dastoor first began experimenting with the class of plastics known as semiconducting polymers in the mid 1990s. By breaking the semiconducting materials down into tiny particles, Professor Dastoor developed a method of suspending them in water, which led to the concept of producing a solar paint or ink that could be applied to surfaces. 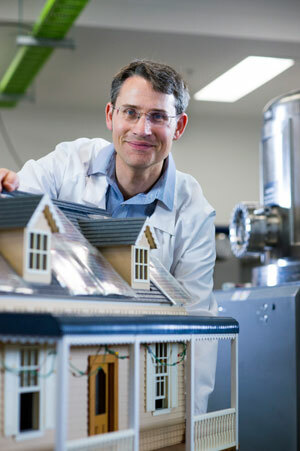 This ambition and ingenuity has captured the imagination of the general public, resulting in Professor Dastoor being part of the Australian TV 'New Inventors' Grand Final in 2011 with his solar paint technology. The Centre of Organic Electronics, which Professor Dastoor is the Founder and Director of, also recently produced the highest-ever performance of solar paint cells at 2.5 to 3 per cent. The cells can already produce at lower light levels than existing solar-based silicon cells with installation costs approximately one-tenth of installing a silicon solar system. "The sun provides us with many times the energy we need every day – we just don't use it. We are focusing on using up stored sunlight in the form of coal or oil. Our ability to dig something out of the ground and utilise it is diminishing rapidly," he said. "Solar paint technology allows us to harvest that energy now. It's lighter, more flexible and less expensive." "By removing the constraints provided by inflexible solar cells, we can open up acres of surfaces to harness the sun's energy more efficiently." When painted across a roof, the cells produce enough electricity to power a household. Dastoor estimates that if the 2.2 million houses in NSW were to use these cells, it would be the equivalent to an entire power station. Within the next six months, the Centre for Organic Electronics is also welcoming new infrastructure and equipment that will help build the next layers of the cells. A newly installed printer at the University's Newcastle Institute for Energy and Resources (NIER) has made it possible to print up to a hundred metres of solar cells a day. Professor Dastoor expects the first prototypes to be available within a year. The same technology is also being adapted by the team to build a new generation of sensors for a range of industry sectors from health to mining and safety. "Because we have developed paint with semi-conducting particles, we can now 'download' electronic designs, print them relatively cheaply from an inkjet printer and, in principle, build any electronic device." "These materials are all carbon-based, so they are more related to our own chemistry than silicon-based materials that you see used in traditional electronic items like computers and mobile phones. This compatibility provides exciting opportunities for medical applications and we have been exploring ways we can integrate bio-molecules or chemical signatures into printed transistors." "For example, we have now developed a saliva-based test of glucose levels for diabetic sufferers, potentially making blood tests a thing of the past. Our test is up to a hundred times more sensitive than current blood sensors and can be built from an inkjet printer." "With predictions that there will be 500 million people with diabetes by 2020, this will have huge implications in the medical world and for communities around the world – one fantastic benefit being no more needles to test sugar levels." "Sensors which can identify different chemical signatures have potential for applications in many other fields. Our team is currently designing what could become the first integrated explosion detonator system based on organic electronics that will improve mining safety and there has been interest in developing a food poisoning sensor, which can sense the chemical signature of bacteria like listeria or salmonella." While the projects vary across different sectors, together they create a web of interconnected activities that springboard off each other. "What makes the Centre for Organic Electronics and the University of Newcastle different to any other University is that we work from the fundamental and concept stage of physics and chemistry through to applied science then to pilot-scale and large-scale production – we do the whole project from start to finish." "Many of the things we are doing on one project are interconnected and have implications for the other projects. This is displayed with the work we are doing with Cambridge University to build the world's first atom microscope, which has come about from our work on organic electronics. "At the fundamental end of physics, we are currently at the birth of feasibility for a new technology. We hope to have images produced from the microscope within a year." With a number of breakthroughs for all these projects expected to take place in the next six months, Professor Dastoor is making a fundamental difference to our organic electronic future.